Online registration is now closed. If you wish to attend, please call the office with credit card in hand before 2pm at 503-552-8813. 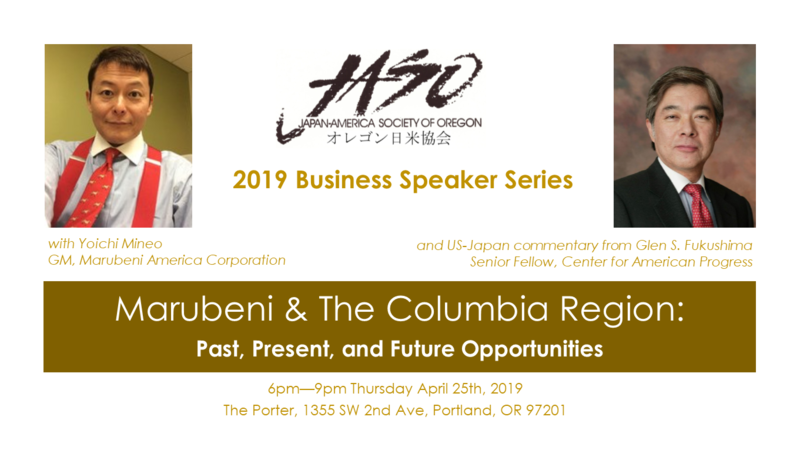 From 6-9pm on Thursday April 25th we welcome two distinguished US-Japan trade experts with different specialties, in our 2019 Business Speaker event supported by the Keizai Koho Center, which is a part of Keidanren in Japan, and the National Association of Japan-America Societies. Yoichi Mineo is the General Manager of Marubeni America Corporation. Marubeni is one of Japan's best-known shosha (trading companies), and has been doing business across the US for decades. Marubeni owns a grain elevator at the Port of Portland on the Columbia River, and does business locally around our region as the subsidiary Columbia Grain International. CGI buys millions of dollars of grain, soy beans and other agricultural products annually from the interior of the Pacific Northwest, and ships to both Japan and Asia more widely. Mineo-san explores not just the past and present trade activities, but also speculates on the future of food supply, and how our region may need to change in order to thrive. Glen S. Fukushima is a Senior Fellow at the Center for American Progress in Washington DC. A frequent and respected media commentator on the US-Japan relationship, Glen has experience at the highest levels of government, business and trade organizations specializing in business between our two nations. In a world where organizations have to manage both short-term change and long-term trends in order to succeed, Glen's exceptional insights equip us with valuable tools to help us direct our decision-making towards success. The event takes place in downtown Portland, at The Porter hotel at 1355 SW 2nd Ave. Affordable parking is right across the street at the SmartPark garage between 1st and 2nd on Jefferson. The evening costs just $20 for JASO members, and $25 for non-members, and includes a post-event reception with food and beverages while you network, meet the speakers, and discuss the content of the presentations.